Husband and I have been to San Francisco at least a half a dozen times. In all those times, we never ventured out to Alcatraz. 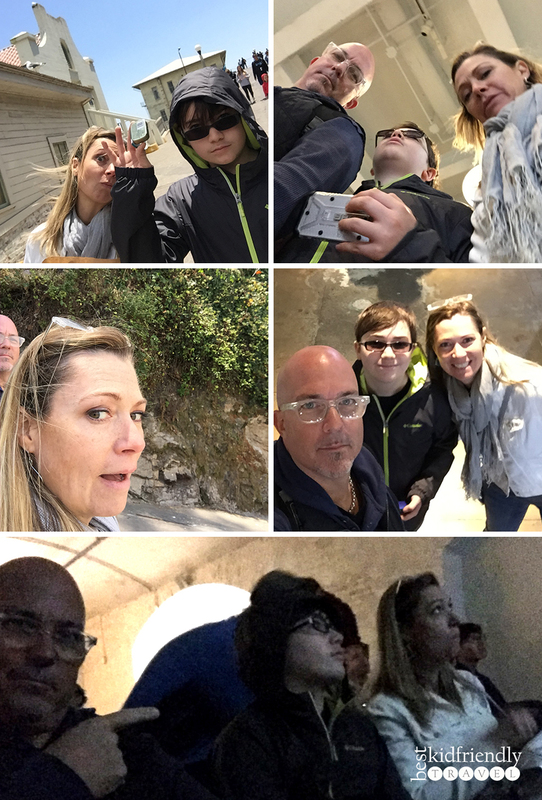 So when we finally brought our son there (we wanted him a little older to appreciate all the food, history and culture), we decided now is the time for an Alcatraz tour. Previously, we would go to San Francisco to eat. (There are SO many amazing restaurants there!) And frankly, I thought the idea of visiting an old, abandoned prison was a little creepy. Now that I’ve been there, I’m sad I waited so long to go! Alcatraz was his favorite part of the trip! Which should be no surprise given what a history buff he is. And not at all creepy, but instead it was so interesting! When researching tickets, although there are several websites offering them, we decided on Alactraz Cruises because not only do they offer the lowest prices, but they also are the official concessioner to the National Park Service (the organization who runs Alcatraz Island). 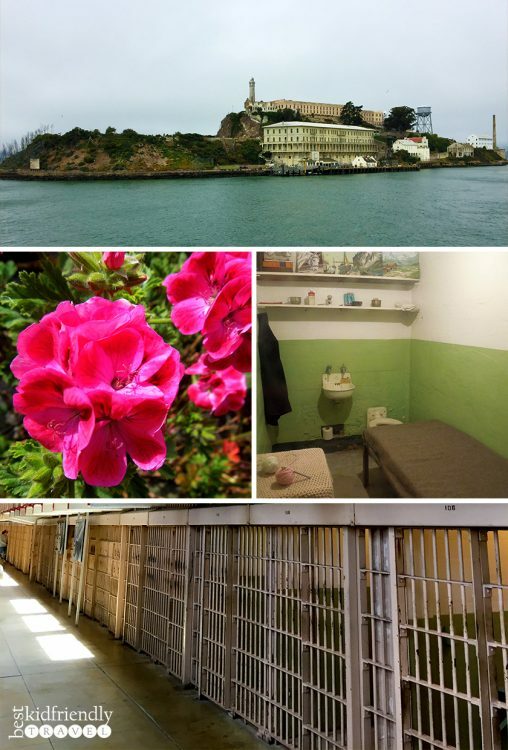 The tickets include round-trip transportation and the award-winning “Doing Time: The Alcatraz Cellhouse Audio Tour”. The trip over is only about 10 minutes, and super smooth… perfect for a seasick-prone person like myself. They have stroller and wheelchair parking, restrooms, and beverages like water, coffee and beer onboard, as well as snacks… hot dogs even if you want or need something heartier. Big windows all around the ferry as well as outside seating up top, offer amazing views of the city and San Francisco Bay. We did a 10am tour and the fog had not burned off yet, so the top of the Golden Gate Bridge was still shrouded from view… which is kind of a cool look on its own. The ferry does fill up, but it doesn’t get overly crowded because they have strict limits on how many people they let onboard each way, so you still feel like you have your own space. If you dress for summer in flip-flops, tanks and shorts… you’ll be shivering the whole time. We brought light jackets like the website recommended and were comfortable even inside where it’s coldest. Wear sneakers or other closed-toe comfortable shoes. You’ll do a lot of walking on gravel and stone and it helps you to stay warm. The ferry comes back every hour throughout the day so you can stay as long as you like – so long as it’s at least an hour. But they do have a last trip back, so pay attention to that. Once we arrived on the Alcatraz Island, there was a docent who talked about what we should expect, when the last ferry is, and how to get around on our own, and then sent us off to explore. We started out trying to follow a guided walking tour, but the crowd was too big to hear the guide, so we wandered off on our own. We started out in the first room you come across before climbing any hills and there there was an 18 minute movie by the Discovery Channel playing. If you haven’t seen it recently, I recommend watching it there before exploring. Without having watched the movie, I would not known what all the Indian graffiti was for, or that the officers and their families (including children!) lived on the island as well. It did help make sense of a lot of the things we saw, and gave us things to look for on our journey. Eventually we came upon the area where the Cellhouse audio tour begins so we got in line, selected our language (there are several available), and made sure to all press ‘Play’ at the exact same time. (child’s idea) 🙂 I would say this above all is a MUST. Even though there’s lots of signage throughout the prison, the audio tour really helps you make sense of the place. Plus, it’s very engaging to hear stories from the inmates themselves about life on the Rock. Every now and then we would all press pause and read some of the signs more thoroughly or linger a little longer in a place, then we just picked up where we left off together. You can totally go at your own pace. We learned so much cool history about Alcatraz, San Francisco, and the Bay Area in general while on Alcatraz Island. I’ve always like old gangster movies, so it was fascinating to learn about their real lives, what brought them here, who they served time with, and when/how they got out. All of it was new information to me, and none of it dark and gloomy as I had imagined… just lots of great history. The prison was under renovations during our visit so we didn’t get to see the recreation area and a few other things that are normally on the tour. It was still amazing without it, though. We got to see pretty much everything else, including where they were sent for solitary confinement. 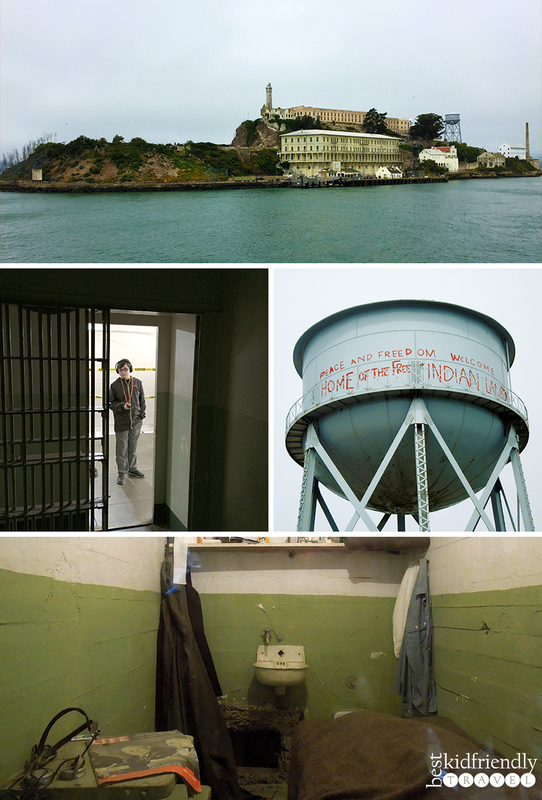 We especially loved that the audio tour showcased the inmates depicted in the movie Escape From Alcatraz (with Clint Eastwood) and that their dig sites were left intact so we could see how they actually escaped. Escape being a fragile term given that they indeed left the prison, but nobody knows if they survived the bay and made it to safety. If you haven’t seen it already, watch the movie with your kids watch it AFTER going there. It’s a surprisingly good movie for kids age 10 and up… more suspense than action so it makes them think, and it’s based on a true story. Plus they’ll recognize a lot of the backgrounds because the movie was actually filmed there. For us it sparked a lot of commentary about how the movie deviated from what we saw and heard on the tour… which proved he paid attention! There are so many items you can buy as souvenirs in the gift shop before you go, I can’t even begin to describe them all. I will say that if you did forget to bring a sweatshirt or jacket, they do sell them in the gift shop. You’re on your own with the sneakers, though. We usually buy a magnet for our fridge, a book, and some other random thing. The Prison Rules I noticed was a popular item, especially for parents, and available in various forms. I overheard several parents commenting to their kids about these being the new ‘house rules’ – the kids didn’t see the humor. Our child chose a couple of souvenir books about the inmates of Alcatraz. For one of them, the author was there signing her book… she asked us where we are from and when we said Minneapolis, she told us that many gangsters lived and hung out in St. Paul and around the Midwest (St. Paul is our sister city in the Twin Cities of Minneapolis/St. Paul). Now we may need to do a gangster tour of our area! Wear sneakers and a light jacket no matter how sunny it is when you start out – it is really cold inside the building, and no signs of heaters to be found. There’s no parking at Pier 33, so take public transit there or walk down from pier 39 (which we did – we actually walked from our hotel). You can take a daypack/standard school-sized backpack but not an oversized backback… for sure smaller than carry-on luggage at the airport. If you’ve been to Alcatraz, I’d love to hear about your experience there in the comments below! 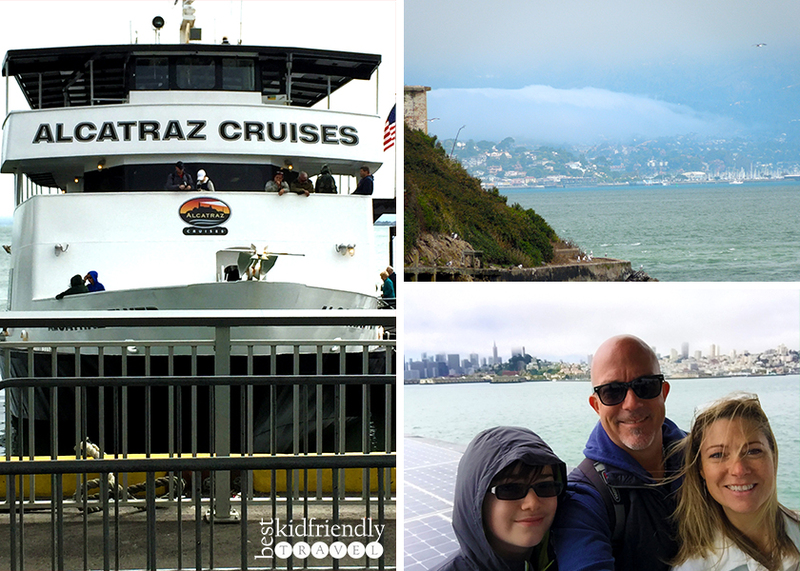 Disclaimer: We were given discounted tickets from Alcatraz Cruises but that did not sway my opinion. I would happily return at full price.